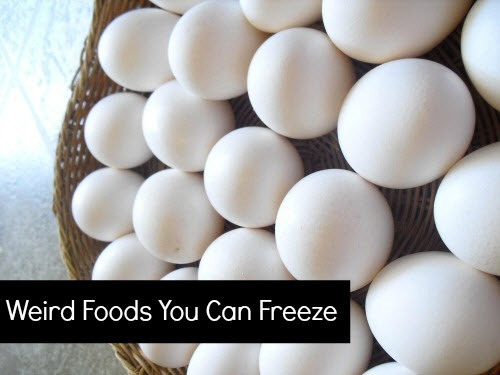 There is a good amount of weird – that is to say, surprising – foods that you can freeze. And this is great news for the more food you can freeze the better! Freezing food is a fantastic way to preserve food and make it last longer. The tutorial presents several unexpected foods that you can freeze (with suggestions on when and how to freeze them). Some examples include: bananas (freeze in the skin), cheese (keep in mind that frozen cheese is not good for slicing since it crumbles when it thaws but works well for baking or as a topping), eggs (remove the shells and freeze the insides with yolk and white together or separate), and garlic (divide it into cloves and keep the skin on when freezing).